Small businesses and start-ups have a certain je ne sais quoi when it comes to attracting new talent. As many employees at start-ups can attest, the prospect of a small, close-knit group of coworkers and managers can be incredibly alluring in contrast with the traditional big-business model that is seen as more bureaucratic in communication styles. And then again, who wouldn’t want a clear line of communication between employees and their bosses? Leading business resources like Inc.com, Entrepreneur, and Forbes all point to accurate and consistent communication as one of the most important characteristics in successful managers, no matter the size of the company. Yet, according to Clutch’s recent survey of 1,000 full-time employees on feedback, evaluation, and fulfillment, many small businesses employees are lucky to have found a manager that provides any feedback at all. The assumption that fewer employees leads to easier communication in the workplace doesn’t hold up when examined closely. Is feedback really all that important? Clutch’s survey results suggest just how influential workplace communication can be on employee engagement and happiness. There is a significant number of employees who find their job unfulfilling when faced with poor managerial feedback. Of the employees who do not receive accurate and consistent feedback, exactly half report their job unfulfilling. Of the employees who do receive accurate and consistent feedback, only 18% find themselves unfulfilled at work. The link between managerial feedback and job fulfillment points to a simple fact most HR experts have known for decades: employees need to feel acknowledged and appreciated by their managers in order to love their job. No ands, ifs, or buts about it; if your employee doesn’t feel like their work is being well evaluated, they will likely begin looking for employment elsewhere. Considering the influence of managerial feedback on employee happiness, it is no wonder that small businesses and start-ups are often idealized by young professionals for their promise of clear and consistent communication. Especially in the start-up landscape, there is a perception that the smaller the company is, the more direct the lines are to the heads of a company. However, Clutch’s survey responses tell a different story. How common are different types of communication in the workplace? 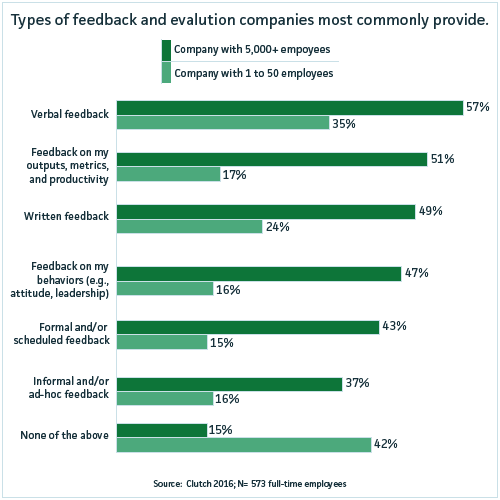 Only 15% of enterprise employees received no feedback at all. On the other side of the spectrum, small businesses offered significantly less feedback across the board. While the most common form was indeed verbal feedback, only slightly more than one-third of small business respondents claimed to received verbal feedback. The highest percentage of small business respondents (42%) said they received no feedback at all from their managers. These results are not a complete surprise. Companies attempting to improve their feedback practices luckily have many places to start. The first, and easiest, is by making sure your organization is providing the type of feedback your employees want. For example, experts have increasingly thought of formalized performance reviews as a thing of the past. However, an average of only 25% of companies are providing the informal, real-time feedback that many employees are craving. One of the most immediate ways of improving your feedback plan is by simply encouraging managers to offer a more diverse range of feedback and evaluation types. This is especially true with small businesses. 42% of small business employees are unlikely to receive the feedback they need in order to be a fulfilled, productive member of a team. In an HR landscape where millennials are increasingly turning towards small businesses and start-ups for the opportunity to receive a more personalized work experience, it is vital to understand and address feedback and evaluation failings at your small business. What makes some managers more successful at giving feedback than others? 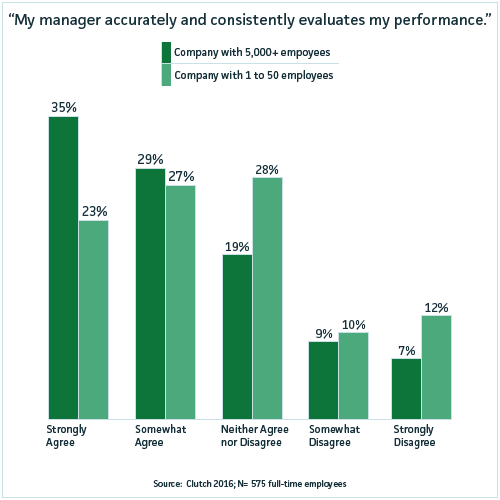 We asked respondents whether or not they feel that their manager accurately and consistently evaluates their performance. Again we found that enterprises have a slight edge over small businesses when it comes to the feedback provided. 50% of small business employees agree. Not realizing improvement is needed. Not providing feedback on the right characteristics. And yet, these issues are relatively inconsequential when you consider the potential loss businesses can suffer from ignoring best practice feedback systems. While these issues can seem insurmountable, there are many steps you can take towards a better corporate culture through feedback and evaluation. Use the talent of your managerial staff to dedicate the time and energy needed to set up an evaluation plan that’s right for your company. For more advice on renovating your employee feedback system, check out Clutch’s expert interviews with leading HR professionals. Reach out to [email protected] with questions or comments.